Hakusan, Japan, January 8, 2014 – EIZO Corporation (TSE: 6737) today announced the installation of equipment to begin producing optical bonding in-house at its factory in Japan. Optical bonding will increase the visibility and durability of monitors for specialty markets such as maritime and medical. 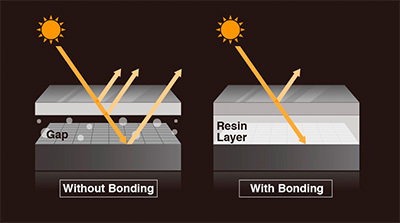 Optical bonding is a process in which an adhesive is used to attach the LCD module to the cover glass or touch panel of a monitor. A layer of resin is used to fill the gap that lies between the LCD module and panel to resolve several issues that negatively affect a monitor’s readability. Eliminating this gap increases the transmission of light to significantly reduce glare and improve contrast. This results in a clearer display for environments with bright ambient lighting conditions or when a monitor is viewed in direct sunlight. Optical bonding also prevents condensation so the screen does not become foggy; a common phenomenon in environments with extreme temperature changes. The additional resin layer also provides increased resistance to scratches, fluids, and dust. Producing optical bonding in-house allows EIZO to continue to meet the needs of maritime, medical, and other specialty markets while ensuring high quality in each of its products. The DuraVision FDU2602W and FDU2602WT marine monitors are the first EIZO products to offer optical bonding as an option.